Should you optimize mobile experiences based on individual handedness? My immediate thought was that the up-vote control was on the wrong side. Why? Because my feeling is that up-votes happen more often than down-votes (because something not interesting is not worth wasting a click on) and the primary action on mobile should be on the left. But that got me thinking. I'm a lefty, so when I hold my phone (in my left hand) it's easier to reach the control on the left, hence my thought to put the primary control on the left side. But for a righty, it would be easier to reach the right-sided control. This may be a trivial example, but if you have a UI that requires a lot of tap-based input it could make quite a difference on which side the most-used action is located. My question: should you optimize mobile experiences based on individual handedness? Has there been any research on this and is this practically possible? Adding a setting which mirrors controls seems possible, but is there a way to detect this and do this automatically? Using the accelerometer perhaps, or maybe by measuring the speed to click depending on distance from either side? I'm not aware of any research into handedness-based layouts. It sounds like an interesting idea and, as a lefty, I'd fall all over any app that catered to my inability to use my right hand like a normal person. However, I would caution that from a practical standpoint, you could probably not optimize for handedness in an automated fashion. To see why, let's suppose you used the accelerometer and were able to detect the hand being used 100% of the time. Perfect, except that you're measuring the wrong thing! The hand using the mobile device is not necessarily the dominant hand. Ever use your phone with your off-hand? Bam! Your app's interface is completely backwards, hindering rather than helping your user. In other words, handedness does not determine behavior. So the best, most consistent way to do this would be to create a setting and send your lefties there. Maybe you could use the accelerometer for this purpose, for example, "it looks like you may be left-handed, would you like to switch to a left-handed layout?" I do not know the feasibility of using the accelerometer for this purpose, but it seems like it would not be trivial. In my original response, I talked about the value of avoiding interactions with an obvious handedness, which I think still applies. (A) Your customers might not want to or know how to change settings (good defaults are important!) and (B) you'd make the job of customizing your UI that much easier. 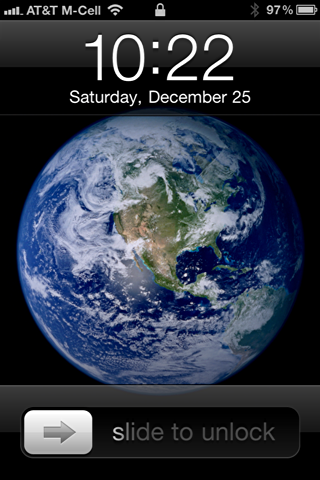 Take the iPhone's slide to unlock or slide to power down as an example. There's no clear handedness to this interaction. It works equally well for righties and lefties. 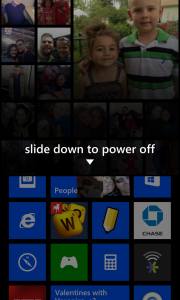 I now use a Windows Phone. It saddens me to say that if you absolutely must design an interaction with an obvious handedness, you should probably favor righties. They make up approximately 90% of the population. My answer would be "no" - because the answer to your second question is "yes". There was a nice piece of observational research recently in UX Matters that covered how people use their phones. Go have a read now - it's interesting stuff - How Do Users Really Hold Mobile Devices? In short - the numbers don't seem to support that left/right handedness is the primary driver of how people hold and use their phones. There are are number of different ways people hold their phones - both one and two handed. On a larger system level, yes we should. Unlike PC's where it is just as easy to click on any part of the screen, the same is not true on a smartphone. Most people are right handed, and are likely to hold the phone in their right hand and use their thumb when they are only using one hand. That makes the area of the phone swept from the bottom left to the top right the easiest to reach, and should be the area that is most used. It is also largely why this area is favoured in both iOS and Android design patterns for the phone (bottom left) and action buttons (usually top right). Now considering that applications already are geared for right handed people, I would argue that you should not optimise for individual handedness. Quite simply because even left handed people will be used to right handed optimised smartphones and apps, so changing that will simply break the paradigm that they are used to. You may be offering a slight design improvement but with it would come a huge expectation penalty. Smartphones are still usable with your left hand, and so breaking peoples expectations would present a worse UX. Not to mention the additional cost and development time. Absolutely yes! Why not a simple global OS level setting. From a design perspective optimizing for left hand use should be a simple matter of inverting the critical parts of the interface that make it handed. Remember that factors other than handedness can determine hand choice: overuse injuries, situation, task, idiosyncracies, etc, so saying no because there are too few lefties is underestimating the actual population. Not the answer you're looking for? Browse other questions tagged usability mobile navigation input touch-screen or ask your own question. How to implement a stack exchange style voting for mobile? How should 'Quit', 'Save Draft', and 'Continue' be positioned on mobile web? Having the “Hamburger Menu” to the right, shouldn't menu items be right-aligned as well? Should preferred control come first on mobile device?